ii. Connect your own Bluetooth Speaker for better sound quality. From Laser Beam Pro, go to Setting > Bluetooth and select to pair your Bluetooth speaker. ii. Connect your own Bluetooth Speaker for better sound quality. From your iOS smartphone/tablet, go to Setting > Bluetooth and select to pair your Bluetooth speaker. Make sure to Slide up bottom bezel and tap the music section to look for the connected Bluetooth Speaker to activate it, which is going to be your main sound source. The volume can be controlled from the smartphone/tablet device, not from the projector. i. This method only supports YouTube and Amazon Prime TV. ii. From Laser Beam Pro, go to Android Mirroring and then select to turn on Smart View option from your Android Smartphone/Tablet which may be labeled as ‘Smart View’, ’Smart Mirroring’, ‘Screen Sharing’, or etc. iii. Connect your own Bluetooth Speaker for better sound quality. From your Android smartphone/tablet, go to Setting > Bluetooth and select to pair your Bluetooth speaker. OR from Laser Beam Pro, go to Setting > Bluetooth and select to pair your Bluetooth speaker. iv. May use data if you don’t use Wi-Fi while using internet. i. Simply connect your Android Phone to Laser Beam Pro by using *MHL or *Micro HDMI to HDMI cable. iii. Connect your own Bluetooth Speaker for better sound quality. From your Android smartphone/tablet, go to Setting > Bluetooth and then select to pair your Bluetooth speaker. OR from Laser Beam Pro, go to Setting > Bluetooth and select your Bluetooth speaker. i. Simply connect your device to Laser Beam Pro by using a micro HDMI to HDMI cable. iii. Some apps might NOT be running properly due to other restrictions applied by the developer. Please contact KDCUSA to find out App supports. 3. How to watch YouTube Live TV: You may follow the step B, E, or F from above instruction. 4. Other APPS: Some apps might be incompatible due to the size limitation and other restrictions applied by the developer. You may only install up to 2GB worth of apps, and the system may require you to delete some of the apps to free up some space in order for you to be able to install the app that you wish to install. * ALL Cables and Adapters are NOT included and must be purchased separately. i. Simply connect your game console, such as Nintendo Switch or PS4, to Laser Beam Pro by using *micro HDMI to HDMI cable and *HDMI switch box w/AC adapter. ii. Connect your own speaker system to Laser Beam Pro by using an *Auxiliary cable for better sound quality. 4. Bluetooth devices: Supports up to Bluetooth V 4.0. May connect up to 7 different Bluetooth devices such as speaker, keyboard, mouse, headset, etc. simultaneously. 6. For external power bank, it has to be more than 5.0V 3500 mAh to use with Laser Beam Pro. - Throw Distance: 2 ft. – 15 ft.
- Power: C type charger 110 – 220 Vac. 1. Use Power Button as Power Saving mode button: The ‘Power Saving Mode’ will be initiated if the projector is not in use and will be shut down completely if not turned back on within 20 minutes for battery saving purposes. 2. Use Back Button as Mouse Mode button: Press and hold the back button to turn on virtual mouse mode. Repeat this process to disable this mode. 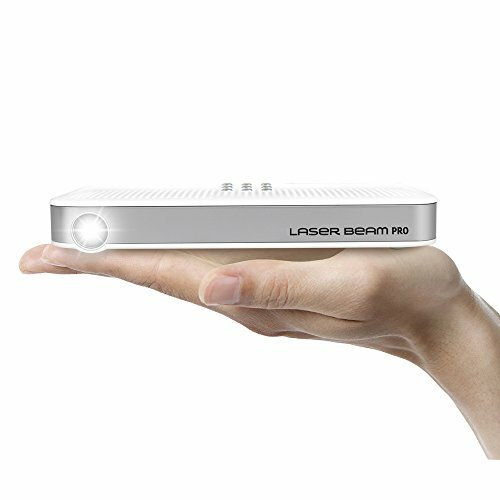 If you have any questions about this product by Laser Beam Pro, contact us by completing and submitting the form below. If you are looking for a specif part number, please include it with your message.